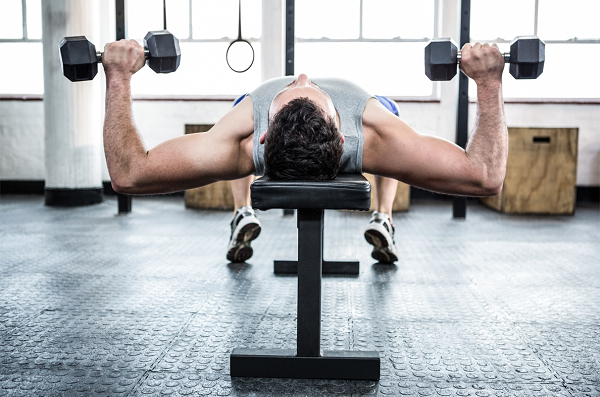 The dumbbell bench press is a pec stretcher. Doesn't it already look like maximal pectoralis major activity? No, a high EMG activity will not necessarily translate into improved long-term muscle or strength gains, but it can tell you a lot about the biomechanics of different exercises and/or, as in the latest study by de Araújo Farias et al. (2016), exercise equipment and order. The true purpose of this study by scientists from Brazil and the US was to investigate muscle activation, total repetitions, and training volume for three bench press exercise modes, the smith machine (SMBP), barbell (BBP), and dumbbell (DBP) - all followed by a triceps extension (TE). Hypoxia + HIIT = Win? With nineteen trained men as subjects, the scientists had each study participant perform three testing protocols with 4 sets of bench presses (10RM) with dumbbells, barbells or smith machine being the primary exercises that were then followed up with triceps extensions and two minutes of rest. Figure 1: EMG activity in pectoralis (left) and the anterior deltoids (right | de Araújo Farias. 2016). Surface electromyographic (SEMG) activity was assessed for the pectoralis major (PM), anterior deltoid (AD), biceps brachii (BB), and triceps brachii (TB). Figure 2: Bench press repetition performance and volume for each mode (de Araújo Farias. 2016). The results of the scientists' EMG and total volume analyses indicat that (a) dumbbells elicit a significantly greater pectoralis major activity than barbells, that (b) the anterior deltoid (shoulder) activity peaks on the smith machine, and that (c) the triceps does the least while the biceps the most work when the bench press is done with dumbbells instead of smith machine or barbell. 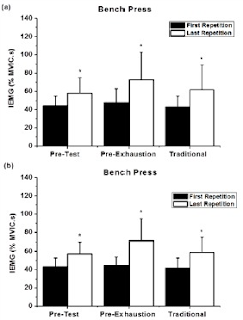 Figure 3: Mean and standard deviation values for IEMG (a) bench press (pectoralis major activation) and (b) bench press (triceps brachii activation) with and without pre-exhaustion in Suares. 2016). Why exactly, the triceps activity during the triceps extensions was still reduced after the dumbbell bench press is not clear, but one may argue that the higher EMG activity after barbell bench presses may be the consequence of pre-exhaustion, which has been shown to augment muscle activity in previous studies, already (Brennecke. 2009; Soares. 2016 - see Figure 2); this, obviously, implies that the muscle activity in the barbell trial was increased, which is different from the initially questioned assumption that using dumbbells despite (or rather due to) their low strain on the triceps yielded inferior results. 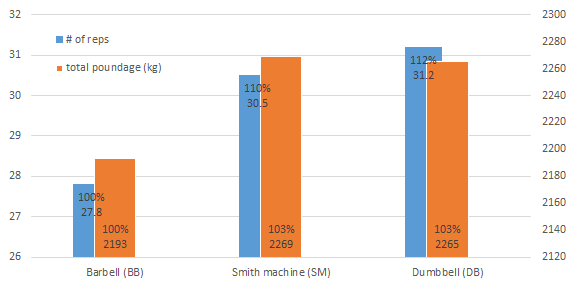 What I can and still want to tell you, though is that using dumbbells had the added benefit of showing the least interference with the subsequent triceps extensions (total volume: BBP = 1204.4 ± 249.4 kg; DBP = 1216.8 ± 287.5kg SMBP = 1097.5 ± 193 kg) - an observation that appears logical, and still raises the question: what's more conducive for your gains? The pre-exhaustion of the triceps you get from barbell bench presses and the resulting increase in EMG activity, or the rest your triceps will get during dumbbell bench presses and the subsequently increased training volume during triceps extensions. Well, I can't tell, but based on previous studies, it would appear as if the increased activity and decreased volume would balance each other out and explain why previous research found conflicting results (Prestes. 2015). So what do I do? You remember the benefits of daily changing loads I discussed in June 2016? Well, what if you kept your body guessing on the type of equipment you use, as well? I would not necessarily recommend switching back and forth between barbells, dumbbells, and the smith machine within a single workout and/or from one workout to the next. What may make sense, on the other hand, is using dumbbells for two, barbells for two weeks, each, and the (boring ;-) smith machine for another week in a 5-week cycle and thus making sure that you grasp the individual benefits of each of them and the added benefit of motivation and keeping the muscle guessing. On a side note: The study confirms what many of you probably "felt" anyways. The "best" as in "most pectoralis specific way" of bench pressing is clearly the dumbbell, which - much in contrast to the barbell and smith machine - do not allow the pecs to rest while triceps and front delts take over and lift a sign. percentage of the weight | Comment on Facebook! Brennecke, Allan, et al. "Neuromuscular activity during bench press exercise performed with and without the pre exhaustion method." The Journal of Strength & Conditioning Research 23.7 (2009): 1933-1940.
de Araújo Farias, D., et al. "Maximal strength performance and muscle activation for the bench press and triceps extension exercises adopting dumbbell, barbell and machine modalities over multiple sets." Journal of strength and conditioning research (2016). Prestes, Jonato, et al. 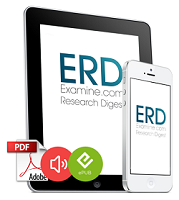 "Discussion of “The effects of pre-exhaustion, exercise order, and rest intervals in a full-body resistance training intervention”− Pre-exhaustion exercise and neuromuscular adaptations: an inefficient method?." Applied Physiology, Nutrition, and Metabolism 40.8 (2015): 850-851. Soares, Enrico Gori, et al. "Comparison between Pre-Exhaustion and Traditional Exercise Order on Muscle Activation and Performance in Trained Men." Journal of sports science & medicine 15.1 (2016): 111.